Wincanton Racecourse stages its richest raceday tomorrow, Saturday 9th November where the prestigious Badger Ales Trophy and totepool.com Elite Hurdle take centre stage. "It's been well documented about our forthcoming changes this season with Tom Jonason stepping up as Assistant Trainer and Daryl Jacob scooping stable jockey alongside Harry Derham, Nick Scholfield and Ryan Mahon. There's also a big change on the equine front - we've sold on a lot of horses and bought a number of new ones, so it's a fresh team ahead - horses and staff. "I know it's going to be a while before I'm back in pole position but I'm just as determined to have a successful season for team Ditcheat and our owners. Nicky Henderson's a marvellous man and his current stock will be a stiff task to beat. "It's good to see other West Country trainers also delivering on winners. It's hard to believe that 15 years-ago Manor Farm Stables was a small training yard with only 28 loose boxes. Now, it can accommodate 82 horses with our second yard catering for another 43 horses. 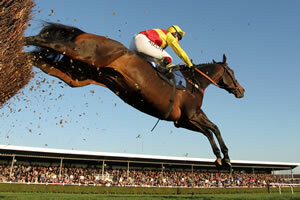 "I love racing at Wincanton and the more runners I could have there the better. Barry Johnson and his ground team do a fantastic job with the course. Last season, Wincanton managed to retain 17 out of 18 fixtures when we at Highbridge Yard were underwater! I learnt that they invested in a gazebo to shield elements of the track from the rain. "My seasonal focus will be next week's £60,000 Badger Ales Trophy Race Day on Saturday 9th November. The last five years have seen us score three winners with regular placings for the past decade. "There are a few horses that we will aim for this valuable contest including Poungach, who won novice chases last season at Haydock and Kempton. He still needs to improve his jumping but he's an out-and-out stayer who could be ideal for the Badger Ales Chase, so we'll try to have him ready to run for his life that day. "Foggy's Wall won a couple of bumpers at Wincanton last season, though the ground was softer than I would have liked for the second of them. He's a decent horse who jumps hurdles nicely and we'll aim him at the equally valuable Elite Novice hurdle at Wincanton on Badger Ales Trophy Day. "Both Zarkandar and Celestial Halo enjoy Wincanton's tight circuit and have thrived in the Champion Hurdle trial: Bathwick Tyres Kingwell Hurdle. Far West is a possible this year. "It's hard to pick out a dark horse for the season but I'll opt for Just A Par who has had two runs over hurdles for me and was second twice. I think he'll be an exciting chaser if he gets lucky." Paul Nicholls' 2013/14 seasonal brochure, £15 inc p&p, is available now from paulnichollsracing.com - All profits go to charity. Gates open on Saturday 9th November at 10.00am with complimentary racecourse tours and tipsters talks with racing pundit Luke Harvey before racing. Advance packages are available online. There's also a courtesy bus service to meet trains coming into Templecombe at 10.25am (London Waterloo) and 10.43am (Exeter St Davids) and will leave the racecourse at 4.00pm.